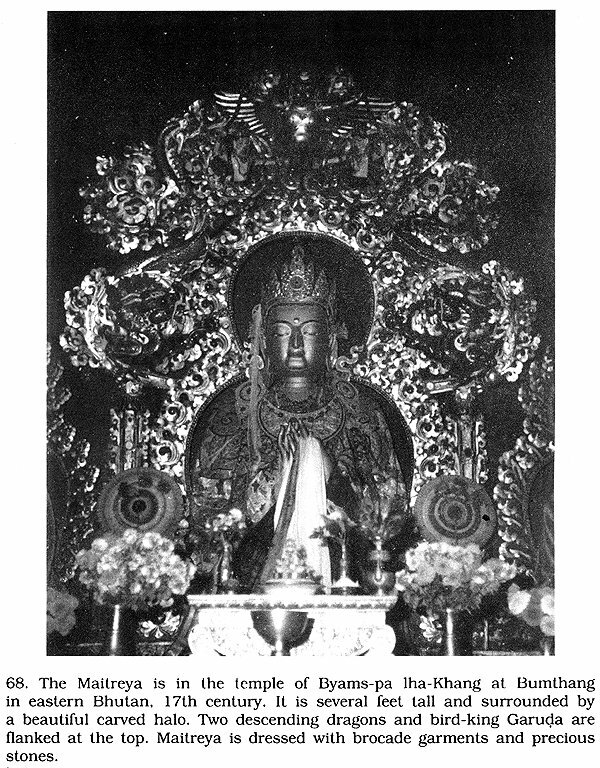 Maitreya was known to early Indian Buddhists in three distinct roles – as a member of Sakyamuni’s audience, as a great Bodhisattva who rules over the Tusita heaven and welcomes believers to share its joys and as the Buddha-to-be, who in future will attain the Enlightenment and leads countless hosts to salvation. The art and iconography of Maitreya throw on the material culture of India for various centuries. But barring a few exceptions there was hardly any comprehensive study on Maitreya from the point of view of an art-historian and art-critic. 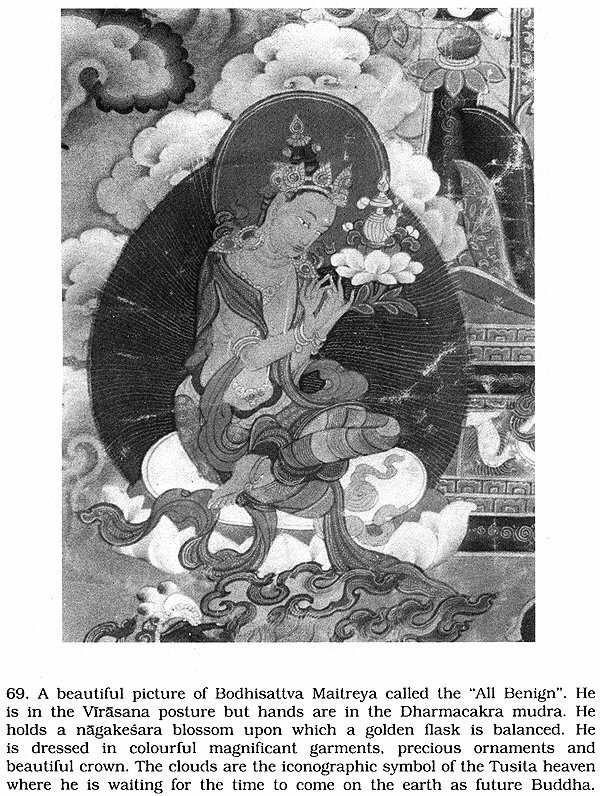 This excellently illustrated the “Maitreya Buddha in Literature, History and Art” is a welcome beginning of specialized studies on Maitreya, the future Buddha. The present work shows the untiring zeal and the discriminating insight of the author in collecting and assessing the facts. The author with his extensive and intensive studies of both original Sanskrit and Pali Literature and Buddhist art evaluates as a part of a single scheme. She also exibites that objective description should be accompanied with an exposition of meaning of historical, literary, and religious inspiration which brought the art into existence. 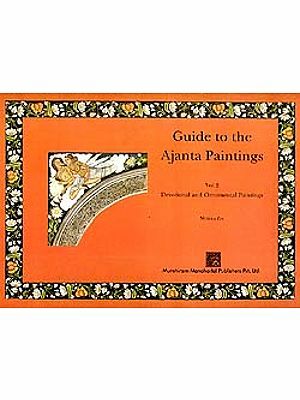 The book describes in detail the growth of Buddhist art and advent of Maitreya in the art and literature and the characteristics of its various forms in India and abroad. The book is accompanied by an admirably vivid and concise literary and historical records in which the wealth of beauty is produced. The splendor of the plates glow from the pages of this important work is undoubtedly offer a vast and instructive field of study. The book also ranks among the internationally acclaimed publications of academic excellence opening a new vista on the research study on Maitreya, the future hope of mankind. Dr. Asha Das, M.A., Ph.D., Griffith Memorial Prize Winner (C.U.) is the Rtd. Reader and Head of the Department of Pali, Calcutta University was born in a renowned family of Chittagong (undivided India) which took active part in the Freedom Movement of India. She is widely recognized as one of the leading authorities in the field of Indology. She has made immense contribution in this field with her versatile genius and learning. She has several books and reachers papers to her credit. She is also a translator of original Pali and Sanskrit books. Her books are variously prescribed by the Universities for their Post Graduate and reachers courses. The present book has added an emblem of distinction to her field of reachers related to the Buddhist art and iconography. The concept of Maitreya Buddha is quite popular both in Pali and Sanskrit Buddhism, and it is seen that the belief in Maitreya Buddha is prevalent in all Buddist countries in south-east Asia, Far East and Tibet. In spite of its widespread popularity not much in depth research has been done on the concept and, hence, there has been a long left need for a comprehensive study on it. I am happy to note that this long left need has been successfully fulfilled by Dr. Asha Das. Dr. Asha Das needs no introduction, for she has already established her reputation as an insightful academician and frolific writer with her numerous previous publications on a variety of subjects related specially to Buddhism and Pali. Her present work is a comprehensive study on Maitreya Buddha and the Anagatavamsa. She has spared no pains in collecting a vast amount of evidence, both literary and archaeological, in presenting her thesis in a very convincing manner. She highlights the various facets of the concept of Maitreya Buddha in delineating the process of its development in different countries under different social and cultural conditions. Her work consists of two major sections. One mainly deals with literary evidence and aims at presenting a historical study of the rise, development and spread of this concept. In this historical account she has brought into focus many a tradition that prevails in different countries and has also referred to numerous views presented by modern scholars regarding the possible origins of this concept. The other evaluates and utilizes evidence extracted from the field of art, and this very well supplements the historical study. When handling both these aspects Dr. Asha Das has shown her familiarity with a very wide range of relevant literary sources both in Pali and Sanskrit and also has vividly displayed her thoroughness with the history of art. This is quite evident from the wealth of source material she cites as evidence for her thesiss. In fact this present work would serve very well as a source book for further research on the subject. 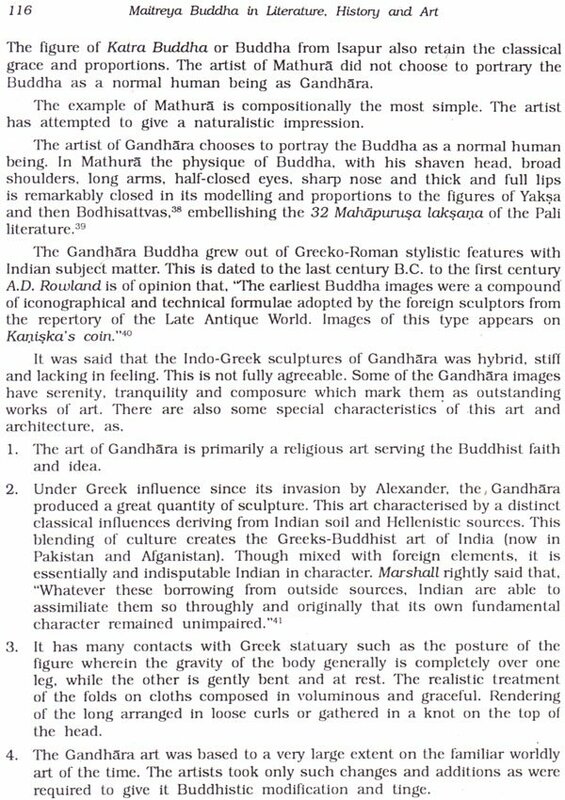 Hence, I am certain that this illuminating work of Dr. Asha Das namely, Maitreya Buddha in Literature, History and Art will be well received by the discerning readers. Maitreya, the Compassionate One has all distinguishing marks, the majestic beauty and the radiance of a proper Buddha. As Bodhisattva and as Buddha he placed the eminent position in the Buddhist pantheon in India and also among the other countries. This status of Maitreya enhanced the need of a comprehensive study. But it is undoubtedly a surprising fact that down to the present time no thorough and all-embracing literary and art criticism have been written on Maitreya, the Future Buddha. Inching Kim’s “The Future Buddha Maitreya”, is perhaps the only attempt so far in this field. But this work is limited in its scope. “The future Buddha Maitreya” covers Buddhist art and sculptures on Maitreya as depicted in India only. The images of Maitreya have a world-wide vat field. 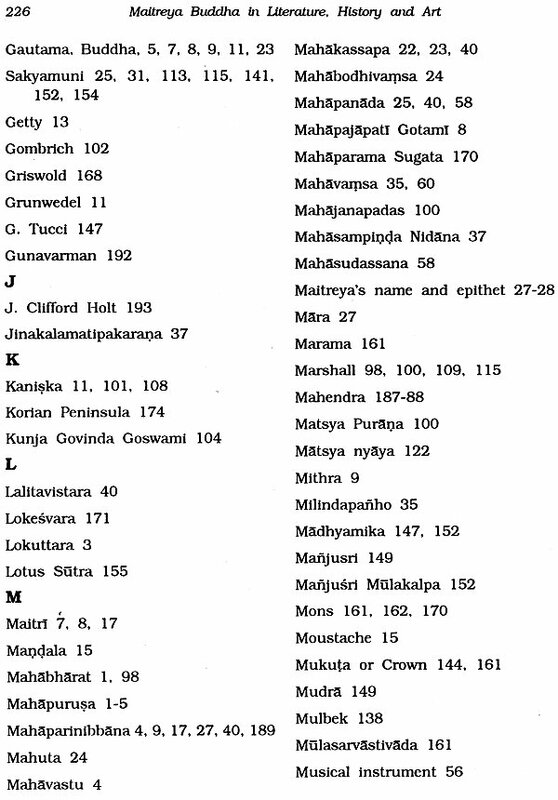 Even the huge literature written on Maitreya in Pali and Sanskrit language not yet been sufficiently studied. The attitude and approach to the subject here are different. The whole study on its Literature, History and Art from the beginning to the present day is too wide a field for one volume. The present work covers an extensive study and draws material from the all available sources. For this reason, I cover the book in three parts. Part-I relates the advent of Future Great men, Maitreya, the Future Buddha, Anagatavamsa, the life of the Maitreya, the role of Maitreya in other literature and glossary. 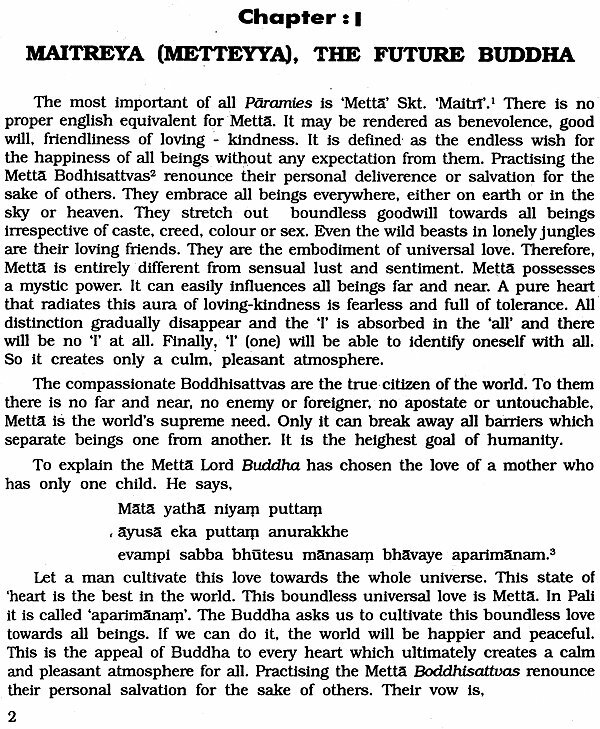 In writing this part Maitreya in Literature, I have dwelt more on life and teachings of Maitreya written in Pali, Buddhist Sanskrit and Sanskrit. These were followed by English translations of eminent translator excepting which all the renderings of the passages are my own. In my treatment on the literary evidence of the life of Maitreya I have spared no pains to make full use of the materials available in the Anagatavamsa to make the book up to date. 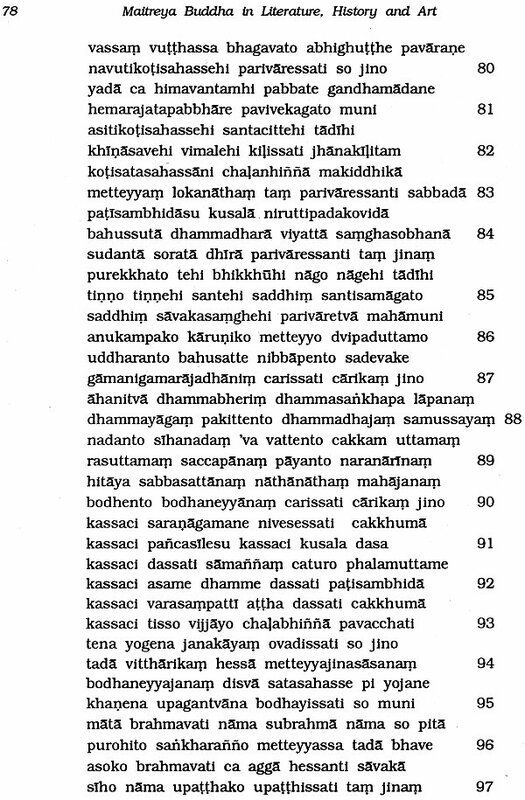 The short writings are inserted as a glossary to clarify the terms which plays an important part in the Anagatavamsa. I hope these create a special interest to the reader owing to their close relation with the topics. Part-II states, the origin and development of the Buddhist art, the images of Maitreya in India and other Asiatic countries. 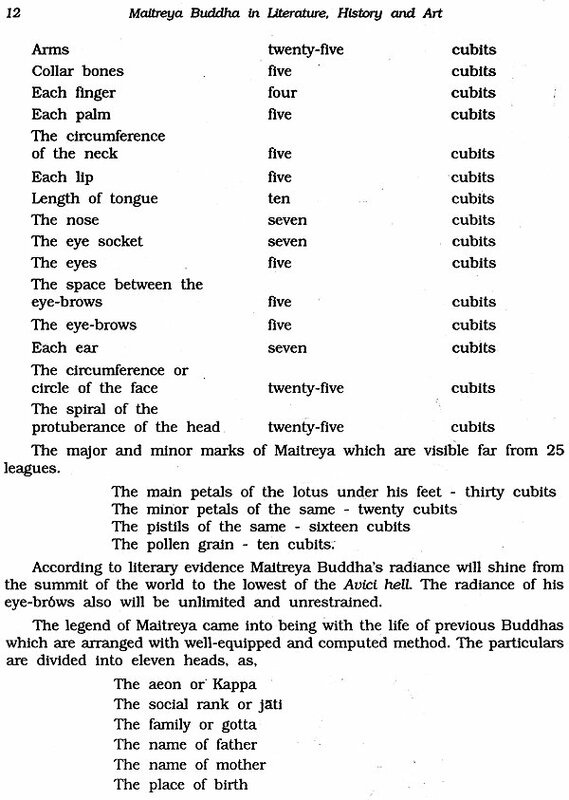 The object of this part (Maitreya in History and Art) is to present a systematic study on history and art of Maitreya episode in different parts of India and abroad which gained importance in the history of Buddhism. Theravada as well as Mahayana. 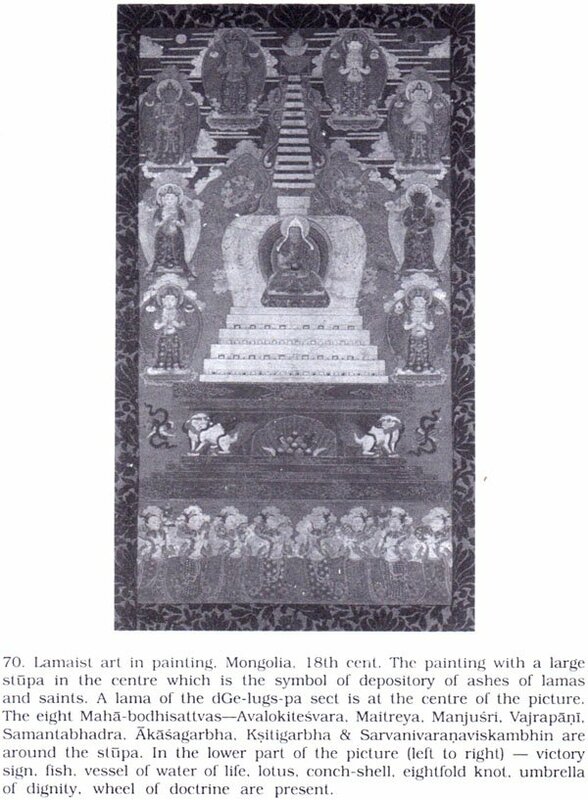 The art and architecture of Maitreya image is one of the wonders of the religious art of Asia. The Maltreya myth like all other Buddhist projection acrosses space and time. I relate the art and architecture of Maitreya in India, Ceylon, Burma, Tibet, China, Japan, Nepal, Korea, Thailand, etc. Any sort of Buddhist heritage of these countries are presented in abridged form. Part-III takes the reader quickly through the pictures of Buddhist art specially Maitreya in the different parts of the world. 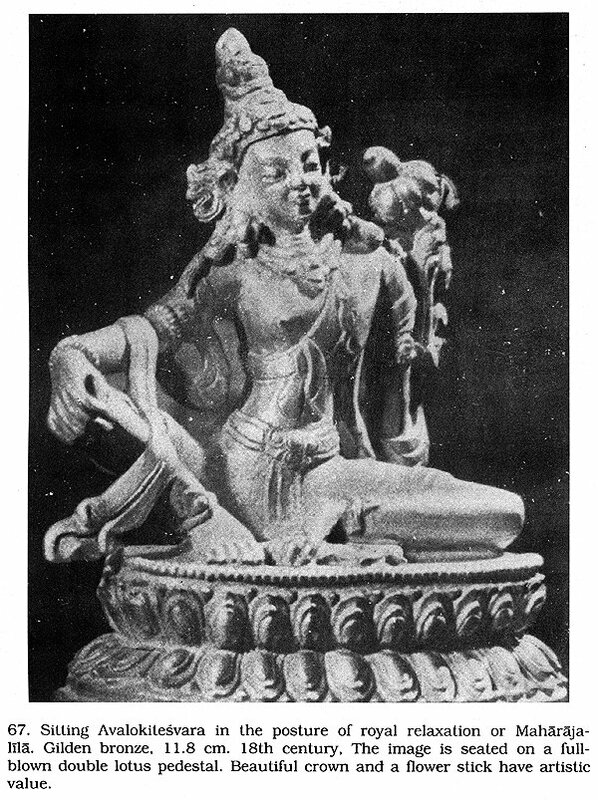 The structural features, characteristics as well as charm and beauty of the images of Maitreya are discussed. I also owe a great debt of gratitude to my parents Late Mohendra Kumar Das and Sabitri Das and my teachers Late Professor A.C. Banerjee. Prof. K. K. Ganguli and Dr. Sukumar Sengupta. I also express my profound regard to my elder brother Sri Phanibhushan Das for his constant encouragement and sympathy from my childhood. It is difficult adequately to express my sense of gratitude to Ven. Bellanwila Wlmalaratana, Professor of Pali in the University of Jayawardhanpur, Colombo, Sri Lanka for his scholarship, fairness of judgement which have made his foreword accomplished. I am indebted and convey my gratitude to Ven, B. Upatissa, Mahathera, President, Mahabodhi Society of Sri Lanka and Ven. Vimalasara Mahathera of Bodhgaya. I thank my students Dr. Ramesh Mukherjee, Professor of English. Asansol B.E. College, Dr. Hikotaro Furuta, Professor of Japanese language, Visva Bharati, Dr. Sunithananda Bhikkhu , Professor. Deptt. of Pall, National University of Bangladesh, and Dr. Jinabodhi Bikkhu, Professor of Pali, Chittagong University for their kind help in many ways for bringing out this edition. I am grateful to the Librarians, Central Library, Calcutta University, Mahabodhi Society of India and Mahabodhi Book Agency for their permission to use the libraries. I owe debt of gratitude to Professor Dr. B. Bhattacharya, Dr. M. Haldar (De) of Calcutta University and Professor Dr. B.N. Chaudhury, Rtd. Principal, the Calcutta Sanskrit College, Calcutta and Prof. Dr. D. Bhattacharya for their sympathetic attitude to me. Finally, my thanks are due to Mr. Prasanta Bhattacharya. Proprietor of M/s. Punthi Pustak for his kind help and advice in many ways for bringing out this edition. The Hindus, Jainas and Buddhists advocate dismal and dreary picture of the evils of the future age or Kali-yuga. In this age Kalki, the incarnation of Visnu, the future Tirthankaras and Maitreya, the future Buddha will be born in this world. They have similar legends and certain field of influence in which, with a deep, sublime and wonderful voices they teach the Dharma to their followers and thereby help them to win Bliss. According to the Brahmanical literature Visnu will descend upon the earth at the end of the present age, which is the Kali-yuga or the age of darkness. As the Jews await the coming of a Messiah, the Hindus await the arrival or Kalki, who will destroy all evil, dispel darkness and once again usher in the golden age (the Krita yuga). The Agni purana tells us that in the Kali-yuga thoughtless men will begin to do wrong things like inter-cast marriages, not following the Vedas, not performing Vedic sacrifices etc. Foreign barbarians will establish their supremacy. Then Visnu will appear as 'Kalki , riding on a white horse, with drawn sword, blazing like a comet. He will destroy the barbarians. re-establish the four orders and the castes. He will usher in a new era of purity, rightness and peace and then return to heaven. The Kalki purana is one of the late Upapuranas. It claims to be a continuation of the Bhagavata purana and it deal with future events : There are several indications of its claim to belong to the Bhagavata purana and to deal with future events. It describes the deeds of Visnu to be performed at the close of the Kali-yuga, when he will be born as Kalki, son of Visnuyasas and Sumati of Sambhalagrama. Padmavati and Kalki live in a house built of Visvakarma, two sons, named, Jaya and Vijaya born to Kalki. Kalki's going to the city or Kikata with huge army for chastising the Buddha' and his meeting with the Jina who came out of the city with a large number of his followers are the important events of his life. In giving a dismal picture of the evils of the Kali-yuga in the Ch. 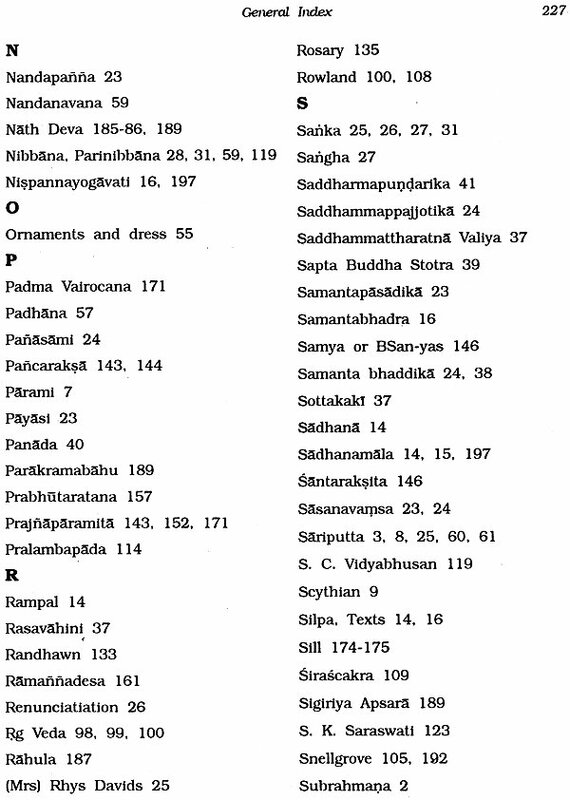 105 the Visnudharma repeats many verses of Mahabharata As "People will hanker after property earned by unfair means and females (eager for union with males) will ardently wish (to imitate) the beauty and gestures of prostitutes." Then people will utter unrefined speech, denounce the Vedic works and make the world stray from the right path. The minds of people will not be inclined to devotion for Visnu in the Kali age. During the first quarter of this age people will decry Hart, but at its end none will utter his name. During the Kali age, the earth will be crowded with many heretics. The icons in a Jaina temple all these names are arranged in a hierarchical Order. Two types of images are generally found : One, a relief containing one, three or twenty-four Tirthankaras; second, images of Tirthankaras in the round. A combination of three Tirthankaras, with the Mula-nayaka in the centre is called Tri-Tirthanka. The portrayal of twenty-four Tirthankaras is called Chaturvimsati. Besides these, there are other combinations also. 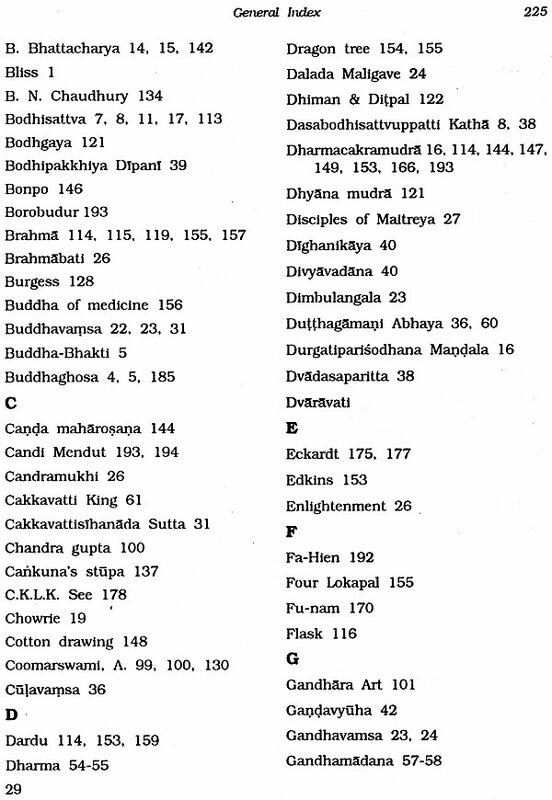 There are 24 Tirthankaras in all including the past, the present and the future. 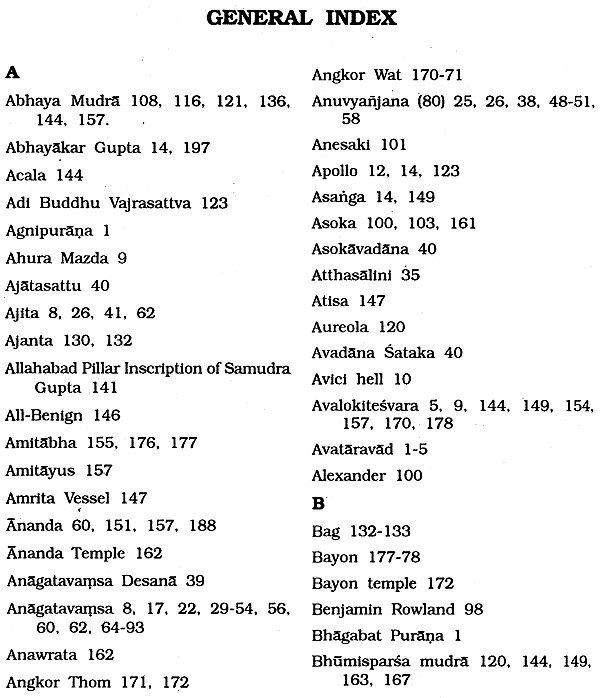 The 24 Tirthankaras occupy the central position in the Jaina hierarchy. The Tirthankaras generally have a Srivatsa (a triangular mole) symbol on the chest, a triple umbrella above their heads, and a lanchana or symbol on the parasol. 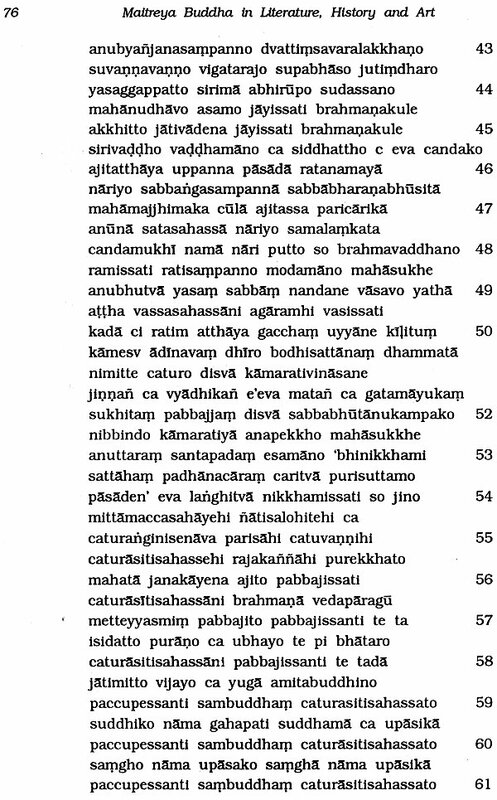 All these Tirthankaras belong to the ancient Indian ascetic. Risabhanatha or Adinatha, the first Tirthankara was the former holder of the 24 present Tirthankara and Mahavira is the predecessor of future Tirthankara who will come in future. 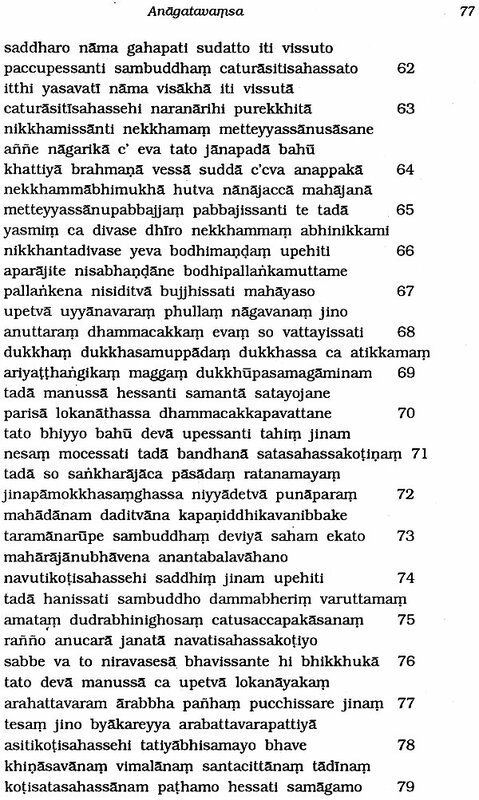 All these are the 'Trisasti Salakapurusa or the '63 excellent man' as stated by the famous Jaina monk Hemchandra. 2. Chalabhinna or six fold super knowledge. 3. 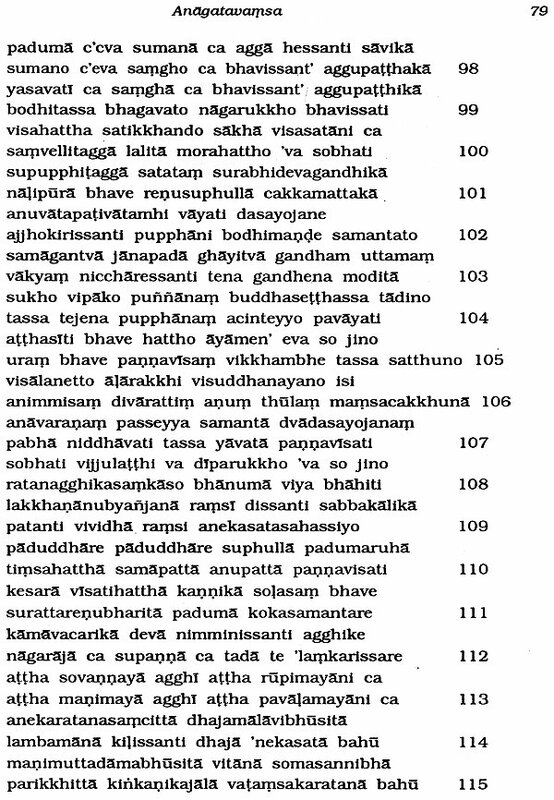 Dasavala or ten powers. 4. Catu-vesarajja or four-fold self assurance or confidence. The Omniscience attributed to the future Buddha is known as sabbannuta nana. His Omniscience is the power within him by which he can direct his attention on anything and anywhere. And by this power he can bring everything within the net of his knowledge or nana-jala. Though according to Theravadins the Buddha is a human being but there was a tendency among them towards the deification of the Buddha. This tendency fully developed into a theory in the Mahdvastu, Lalitavistara and Divyavadana. The Vaitulyakas held the view that the Buddha born and dwelt in the Tusita heaven but visits this world only in a shape which is specially created. All these type of views are near about Avataravada of the Hindus. The Lord Visnu dwelt in the Visnuloka of the heaven but his human shape born in this world as Rama, Krisna, etc. in time to time (sambhavami yuge yuge). The Buddha also out of compassion for all beings descends to the earth dwels here for certain period and establishes the Dharma (Dharma samsthapanarthaya). Mal trey a, the coming Buddha at present reigns in the Tustia heaven and will come on this world as Buddha, the incarnation of love. The faithful Buddhists believe that the Buddha is not really extinct after his Mahaparinibbana, but that somewhere he is present and in existence. Buddha-Bhakti is incomplete without some persisting person as its support. The Buddha, as a Super-mundane Being, had not quite passed away, but persisted in some form or other. Rebirth in the heavens is to them the reward of a holy life. The heavens of the old Hindu gods are replaced by the paradises of the Buddhists in which Bodhisattvas and Devas are reborn. Maitreya, the coming Buddha, also at present reigns and preaches in the Tusita heaven. As Sakyamuni Gautama had to pass through a long period of '550 existences as animal, man and god or 5000 existences; so Maitreya after a long period has come to the Tusita heavens, where he will remain for 5000 years. He will be born as a Manusi Buddha, 5000 years after the death of Sakyamuni Gautama, when the fifth world is created by the fifth Dhyani Bodhisattva Visvapani. According to some, this period is 4000 years and according to chinese tradition, it is 3000 years. 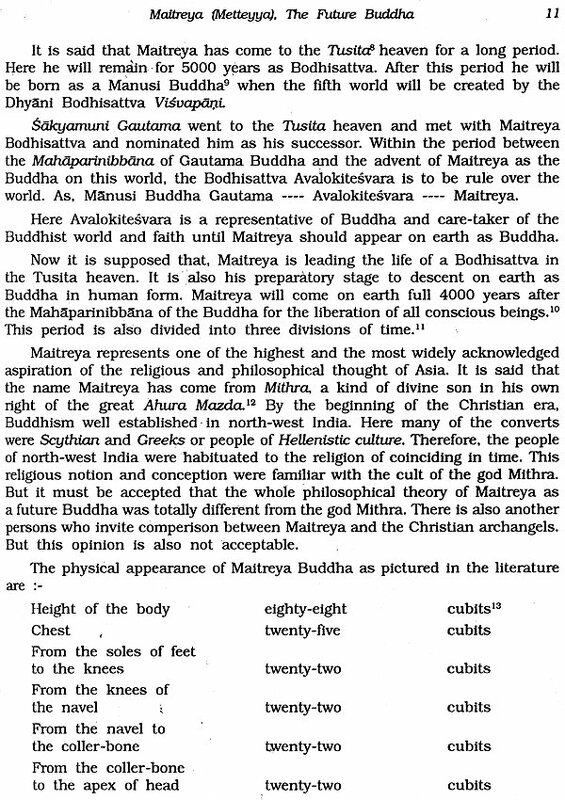 Sakyamuni Gautama, the fourth Manusi Buddha, went to the Tusita heavens to meet Maitreya and nominated him as his successor. During the period between the fourth Manusi Buddha Gautama and Maitreya, Avalokitesvara is to rule over the earth. Since Maitreya is the Buddha-designate, all the Buddhist sages seek communion with him and seek his advice and sanction for their thoughts and deeds. The faithful Buddhists wish to go to Metteyya's kingdom and to stay there until they would be with him in his final life on earth. All these are popular religion. Great efforts are made to integrate these popular ideas with the basic conceptions and universal thoughts of wisdom. 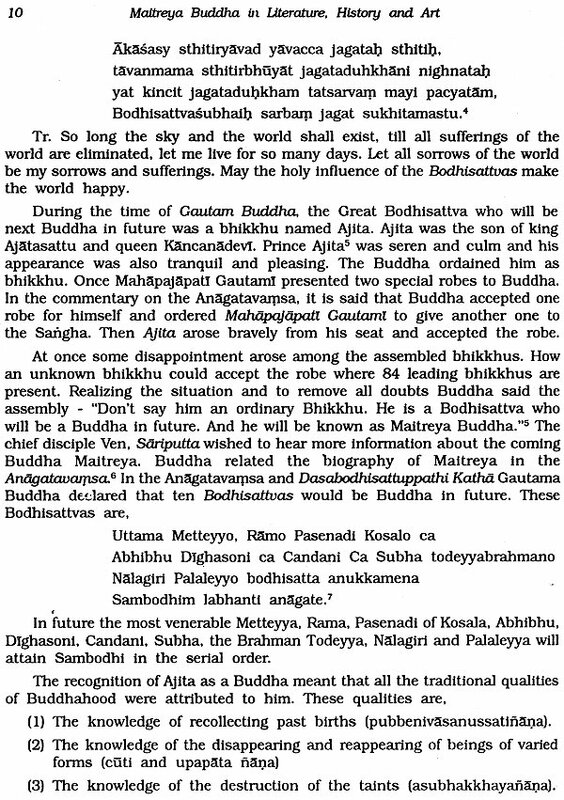 Forecast of Mattreya's birth-the worthy one will be born among men in order to succour the religion of Buddha in the government of the world. The first month, 1st day is the birthday of the Maitreya Buddha (mi-li-fo). These future noble great man will enlarged, ennobled, systematised the ethical doctrines. The Greatmen focussed the attention of the people on the purity of thoughts, actions and words. Buddhism laid emphasis on the Eight Fold Path and understanding of the Four Noble Truths. Similarly Hinduism and Jainism laid great stress on the development of the moral side of the individual and devotion for the greatmen. Tusitapura, Personages of the Aanagatavamsa, Isidatta and Purana. images originated in Gandhara and Mathura. Ellora, Northern India -Kashmir and Ladakh. Japan, Sri Lanka, Java, Afganistan.